In the year 2040 AD, the Reynolds Corporation was given the task of figuring out how to spend ten billion dollars. Everyone knew the Earth was dying. Pretty soon, the money wasn't going to be worth much. After a series of missteps, the chief mission architect, Alex Haynesworth, came up with the Ark Program. They couldn't save the Earth but they could save humanity by sending a group of people to the stars. Since this was long before the PPT drive was invented, the ships would have be sent at sub-light speeds. They used the Grey Drive which was a quantum black hole (QBH) fed a steady stream of xenon molecules. The molecules entered the QBH and exited as hyper-accelerated Hawking Radiation along with some elementary particles: basically a souped-up version of an ion drive. The Arks took a long time to build up speed but when they hit top speed, they could potentially go as fast as 1/10th of the speed of light. But the stars are just so damned far away, that meant that even the closest star, Alpha Centauri, was still 40 years away or more. Other stars, like Tau Ceti, were a hundred or more years away. This was where Alex's genius came in. Risk analysis told them that building a spaceship that would still be in good working order over such a long period of time was statistically impossible. So a "generation ship" - one where people lived their lives, had children and died during the voyage, wasn't going to work. Alex combined a number of ideas and came up with the opposite strategy. Build the cheapest ship possible, basically a tin can, and spend the money on preserving the individuals. A practical method of freezing humans and thawing them successfully was developed. Once a person was frozen, their chamber, called a sarcophagus, could be opened to the vacuum and freezing temperatures of space and it would cost nothing to keep them frozen solid. The sarcophagi were heavily armored. Even so, they knew some would fail, some would be punctured by micrometeorites, but statistically, most of the people would reach their destination. The Ark was divided into five sections. There was the command module in the front. The next section was the Single Stage to Orbit (SSTO) booster. The next section was the crew compartment where the frozen people were stored on racks. The next section was the cargo compartment. 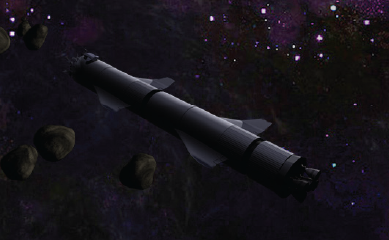 The final section was the propulsion module. The command module was larger than an Apollo capsule and held the three sarcophagi of the command crew, a Captain, a Commander and a Pilot. They were to be awakened first. Once they were awake, they needed to take a space walk and use a thermite ring, ignited by a magneto, to separate the crew compartment from the cargo compartment. The crew compartment had huge delta wings and once separated, they would fly the assembly down to the planet. After the crew was awakened, they would use the SSTO booster to take the command module back into space and dock with the cargo compartment which also had delta wings. At that point, they would jettison the propulsion module and fly the cargo compartment back down to the planet and start the colonization process. Ark I landed on Alpha Centauri (Rogal Canduro) and the whole process actually worked as planned. Ark II was damaged on the way to Tau Ceti and its arrival at Tabit is the basis of Rome's Revolution. Ark III was supposed to go to 82 G. Eridani but when they arrived, there were no habitable planets so the onboard computer took them back to Tau Ceti. The delta wings on the crew compartment were damaged so Captain Dan Harrison landed the crew compartment using the SSTO booster as a retro rocket. But this eliminated the chance for going back up and retrieving the cargo compartment so they started their new lives with "just the clothes on their back." Ark IV was supposed to go to Beta Hydri but there were no habitable planets there so they moved on to Nu2 Lupi. They were able to land both compartments successfully. You will learn their fate in the novel entitled The Milk Run. Ark V, the Stealth Ark, was sent to Chara but the whole mission was a sham. It was equipped with two propulsion modules for the sole purpose of looping around Chara and then returning to Earth. It was basically a time machine used to send people from the past to conquer the future. You will learn more about this mission in novel entitled The Ark Lords.